I used to collect Philippine postcards when I was in 5th grade. I believe it was one of our social studies class projects. I honestly have no idea if my mom still keep them or maybe she got rid of them long time ago. Anyhow, I've been collecting postcards again since I moved here in America, and that was 6 years ago. I send postcards to friends and family every time we travel places, and I always keep one for myself. Now, I'm an active postcrosser member. And I'm enjoying this hobby a lot! Here's my PHOTO album for my POSTCROSSING collection. If you would like to receive a post card from me, just EMAIL me your complete mailing address and will send you a post card from San Antonio/Texas. If you are interested in post card swapping, just let me know. Thanks! 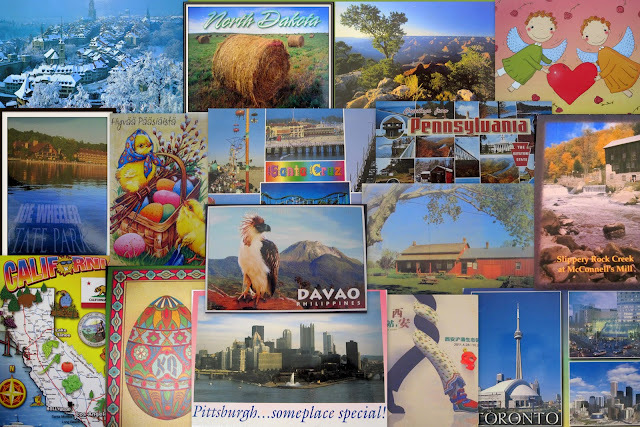 Here are some of the latest postcards I received from blogger friends and postcrossers around the world. What a very fun hobby and collection! Love the montage of postcards you have received. Your mom probably tossed them. I love moms, but they are like that. I like your hobby sis, I haven't tried collecting post card. But with your post, I started to think of it to follow what you did. May I request a post card from you. I am interested with a postcard swapping. Hello from a fellow Postcrosser. Its a great way to 'travel' and quite addictive isn't it, as is ABC Wednesday. Nice collage. Oh wow, dami mong collection sis. Yikes, starring.. hahaha.. unsaon pag-nurture ani nga hobby oi.. akong ganahan magbunglay man..hahahah... was here Mrs. D.
wow, nice one ako honesty hindi nahilig dito pero parang ang gandang gawing hobby ngayon. what a nice collection sis!